WhoScored have named a worst Premier League XI of the season so far, with a big-money Manchester United signing among the players picked out. As we enter the crunch period of the Premier League season, there are a number of stand-out candidates for a PFA Player of the Season nomination. However, while the likes of Riyad Mahrez, Jamie Vardy, Dimitri Payet and Mesut Ozil have excelled, it’s been a campaign to forget for some. 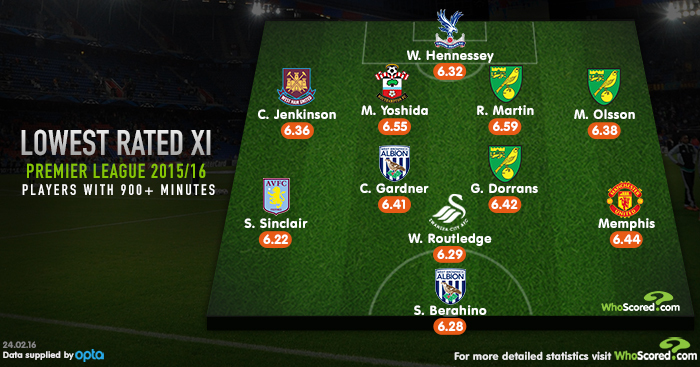 Our friends at WhoScored.com reveal their lowest-rated XI of the season. NB: Only players to have played at least 900 minutes this season – the equivalent of 10 full matches – have been considered. Firmly in place as Alan Pardew’s first-choice goalkeeper this season, the form of Wales international Hennessey has perhaps not been deserving of the manager’s seemingly unwavering faith, with Alex McCarthy and Palace stalwart Julian Speroni in reserve. A save success rate of 66.2% ranks among the lowest in the league, with two costly errors earlier this year contributing to Palace’s recent slump. Prior to a season-ending injury suffered against Manchester City last month, it’s fair to say that Jenkinson hadn’t convinced Slaven Bilic he was the man for the right-back berth at West Ham. The Hammers’ win ratio is significantly better without the Arsenal loanee in the starting XI (46%), while they have conceded 1.85 goals per game when he has started compared to just 0.54 when he hasn’t. He also secured the lowest WhoScored.com rating of the season (3.75) in defeat to Bournemouth early in the season. Considering he has started just nine games in the Premier League (16 league appearances in total), the fact that no player has committed more errors leading directly to a goal than Yoshida (3) is quite something. In general, when the Japan international hasn’t had a nightmare in matches he has been decent enough, but his propensity for a costly mistake has seen him fall down the pecking order under Koeman. Speaking of players with a propensity for a mistake, step forward Norwich captain Russell Martin. The Scotland international has made an impact at the business end for the Canaries this season, scoring three times, but his inability to organise the defence has seen Alex Neil’s side concede the joint most goals in the league at the other end (50). Only three players have committed more errors leading to an opposition shot (4) this season. Another member of an accommodating Norwich defence, Martin Olsson has regularly been understudy to Robbie Brady for good reason. Meagre averages of 1.2 tackles and 1.0 interception per game rank 12th and 9th respectively for the club, with Norwich conceding a woeful 2.0 goals per game in the Swede’s 11 league starts this season. Gardner falls under the ‘useful to have’ category but has struggled to nail down a regular starting berth this season, with half of his 22 appearances coming as a substitute. The midfielder has had a direct hand in just two goals in that time, but it’s his pass accuracy that has been incredibly poor, falling from a low 75.3% to a dismal 64.1%. He registers an average of just 10 accurate passes per game. A former team-mate of Gardner at The Hawthorns, Dorrans has struggled to make his mark following a permanent transfer to Norwich. The Scottish midfielder has failed to score in the league and registered just a single assist in 17 appearances (five as a substitute). With averages of 1.1 tackles, 0.9 interceptions, 0.7 shots and 0.7 key passes per game, Dorrans has flattered to deceive across the board. The captain of this side with the lowest rating of the lot, Sinclair’s permanent switch to Aston Villa has been underwhelming to say the least. It may come as a shock that he is the only representative from the league’s bottom club, but that’s more indicative of the fact that the team have been completely abject as a whole rather than having had a few players let them down badly. Formerly known for his threat on the counter attack, the winger has completed just 15 dribbles in 18 appearances and created a woeful four chances for his team-mates. Wayne Routledge has failed to have any form of impact in the final third this season. Indeed, despite starting 14 of his 17 league appearances, the 31-year old has failed to register a single goal or assist this season. Averages of 0.6 shots, 0.8 key passes and 0.7 dribbles per game are far from Premier League standard. 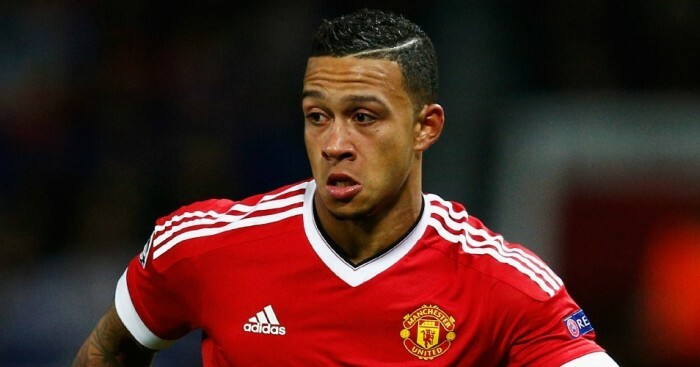 Arguably the most surprising inclusion in the XI – though not if you’ve tracked his league performances – Depay has failed to even come close to living up to expectations in his first season at Old Trafford. Last season’s Eredivisie top scorer (22 goals) has netted just twice in 20 Premier League appearances and has been dispossessed more often than any other player to start 10 or more matches this season (once every 22 minutes). Another player few would have predicted to feature here at the start of the campaign, it’s been a season to forget for Berahino. The 22-year old’s alleged behaviour off the field has seen him restricted to just nine starts from his 21 appearances in the league, scoring a modest three goals. Averages of 0.2 key passes, 0.4 dribbles and just 12.7 passes per game somehow didn’t deter tNewcastle United from bidding in excess of £20million for the striker last month.